I cannot hear the words Baked Beans and not think of that scene in Blazing Saddles….you know the scene I’m talking about? Basically, it’s a load of cowboys sitting around a campfire eating beans and they all begin to thunderously pass wind only seconds after the beans pass their lips. I’m not a huge Mel Brooks fan, but this scene is the first ever fart scene in a movie, so I will give him credit where credit is due. You rarely see/hear farts in film. Considering they are a part of life and everybody does it, you’d think there would be a little more wind on celluloid. I wonder if James Bond ever got a nervous tummy? He’s certainly been in some tight squeezes, so it wouldn’t surprise me, but I suppose he would not be as cool if when push came to shove a little ‘eeep’ squeaked out of his tuxedo……or heaven forbid, a shart. But I digress, back to beans. 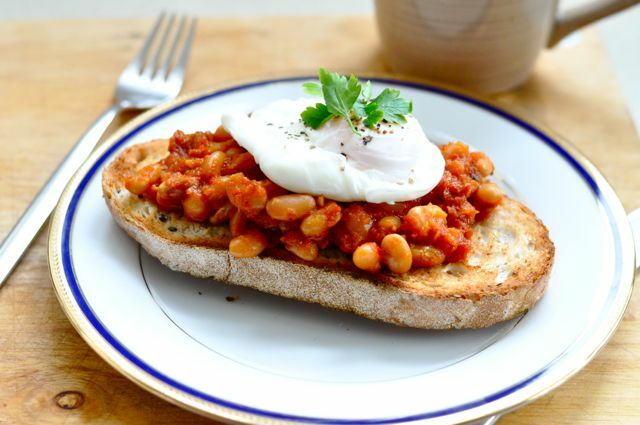 I love baked beans, and they are actually incredibly good for you. Packed with iron, protein, calcium, fibre and they are low GI so they will keep you fuller for longer. All this, and they are really yummy too. 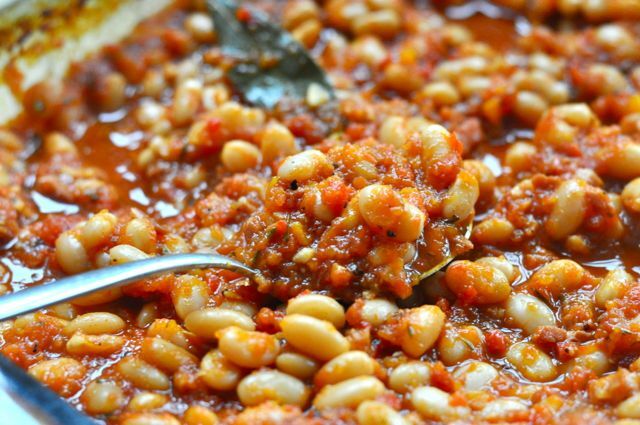 I made these beans as a side dish to a slow-roast pork belly. 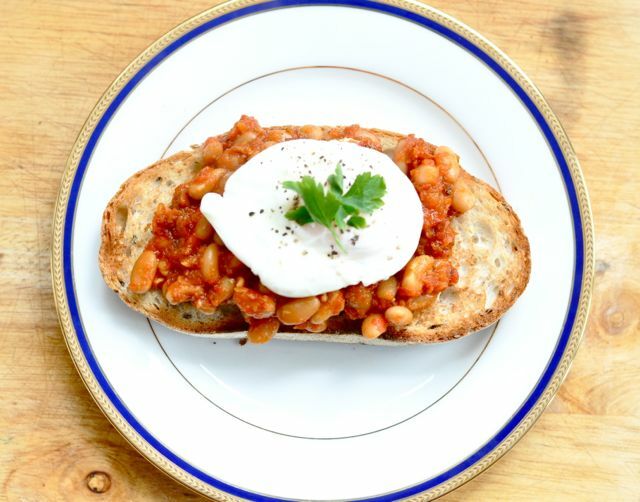 Pork and beans go together like Ginger and Fred, in my books. All at my table enjoyed the combo, but none more than Mister H and I who got to double up with eggs and beans for breaky the following day. It’s surprising we didn’t singe our eyebrows, if you catch my drift. The original recipe for this came from the Riverstone cafe in Bellingen, but I tweaked it to my taste. If you would like to see the original recipe it is here. Drain your beans and chuck them into a pot of lightly salted water, so they are covered with an extra couple of centimetres. Bring to boil, and reduce to simmer until they’re tender (30-40 minutes). 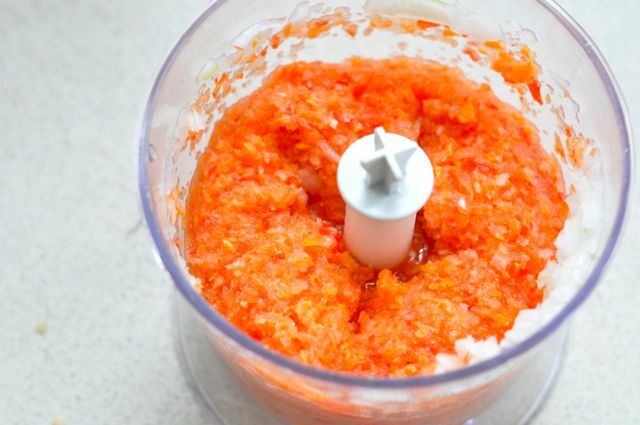 In a food processor, chuck your capsicum, onion and carrot until finely chopped. Heat oil in a large saucepan over medium heat. Add capsicum and carrot mix, speck, garlic and herbs and cook until soft (7-10 minutes). Add salt and pepper to taste. Add tomato, bring to a simmer and add to beans. Add 500ml water, paprika, Worstershire sauce and vinegar, cover with foil and bake, stirring occasionally. After 2 hours, check to see if they need a little more water, add if required, pop back into the oven for another 30 mins or so, until beans are nice and tender but not mushy. You want them to retain their shape. Stir through maple syrup, season to taste and serve with poached eggs and sourdough toast. We’re heavy on the recipes this week as it’s time to wrap up my Spring To Do list……and then we can get onto Summer! Delicious sounding recipe and great presentation. Yum! Thanks Jed! You’re obviously a fan of the humble bean! This looks great! 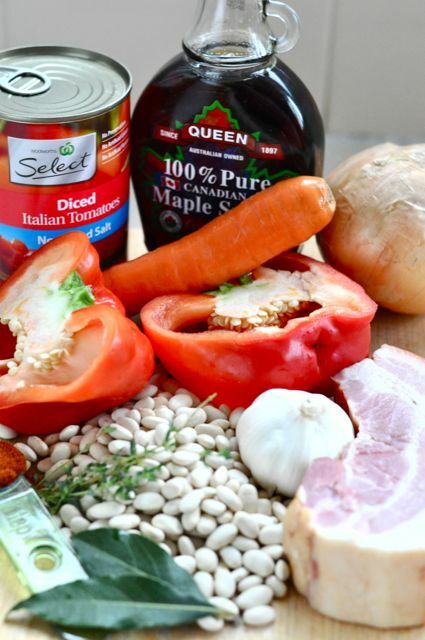 I still have a pork and beans recipe to post one day soon too. Do you really think James Bond farts? Just imagine him letting one rip when he’s with a lovely lady. Do you think he would be cool about it or mortified?